Pinkmans hasn’t been open for very long, maybe just under a year, and I walk past it every day on the way to and from work. They always look to have a huge selection of pastries and bread in the window with a few seats opposite the counter, but when you go in you suddenly become aware of just how much they have to offer and a much bigger seating area toward the rear. The first thing to catch our eye was these donuts. OOOOEEEEEMMMMMMMGGEEEEEE. 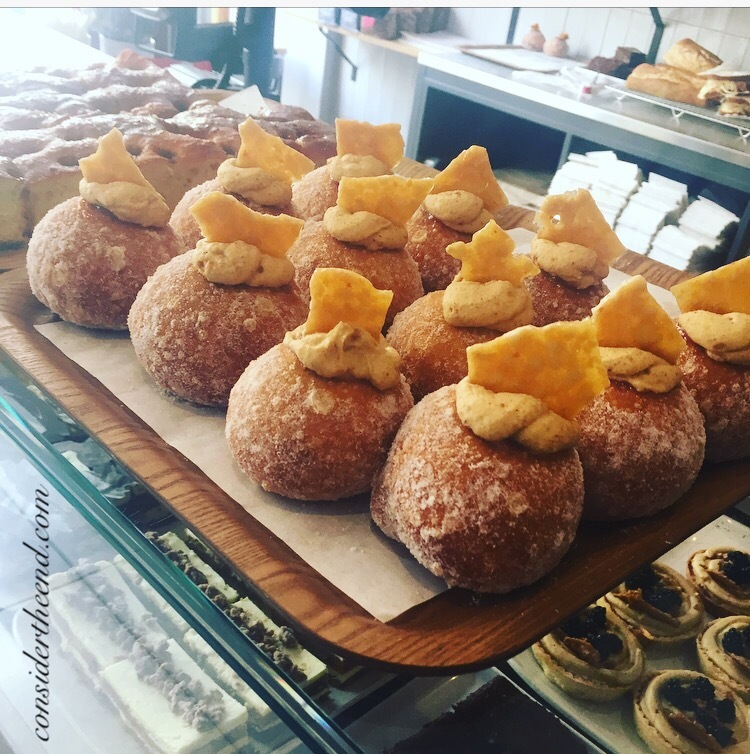 Caramel filled with honeycomb topper. They also had a peanut butter version, but I love honeycomb more so after a little umming and aahhing I placed my order. The girl behind the counter was really lovely as my friend and I questioned the menu; ‘what’s in that?’, ‘do you do these?’ She patiently answered our questions with a smile and friendly chat, which made us feel very welcome. We found a place to sit in the area at the back, the tables were high and the chairs were stools. They were long and thin which I suppose encourages strangers to sit near each other with a ‘is this seat taken?’. This won’t be for everyone, but I quite liked it. What I really like about Pinkmans is the fact that everything is baked on site and they have an open kitchen so you can see the chef taking bread out of the ovens and baskets full of tomatoes or onions by the central counter. They open at 7.30am Monday to Saturday and 9am on Sunday, serving breakfast until 11.30am. You can expect the usual favourites, but with a twist; smashed sweet chilli avocado & tomato salsa on toast, as well as standard toast or fresh bread with butter & jam or porridge. Lunch time sees a selection of sandwiches, filled focaccia, baguettes and ciabatta as well as salads. In the counter I spied an avocado and smoked salmon roll which looked divine. In the evenings you can expect wood fired sourdough pizzas (actually these are available from midday!). On top of all this they do cakes, tarts, desserts, tagines, soup, stews, teas, coffees, beer and wine… I’ve almost definitely missed something, but you get my drift. We only had cake and drinks on my visit today, but I’ll most certainly be back. I’m only gutted that they don’t open till 7.30am, if they opened 30 minutes earlier I could nip in for breakfast on the way to work, but then I’d spend all my money in there, so it’s probably a good thing… I think. 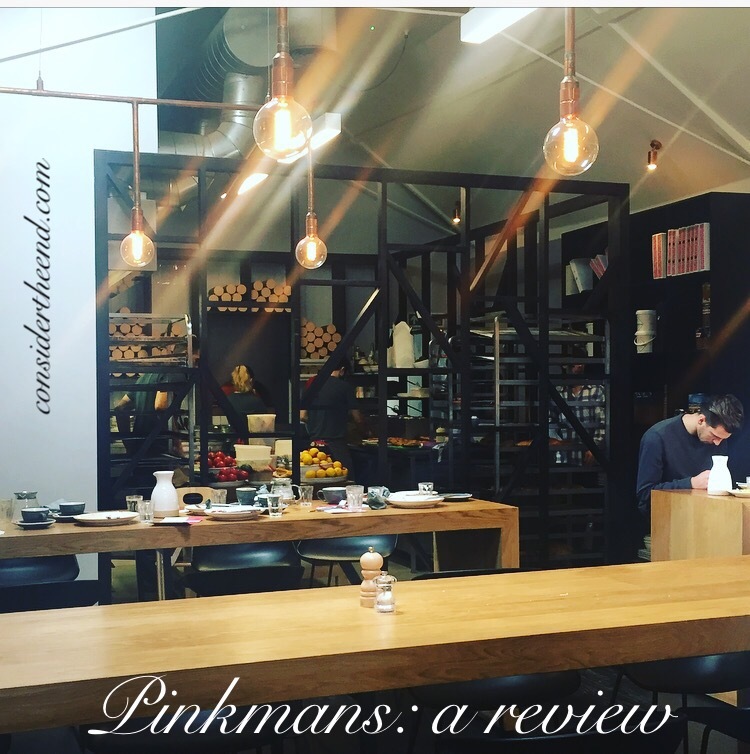 Pinkmans can be found at number 85 Park Street, Bristol and is open 7.30am-7pm Monday, 7.30am-10pm Tuesday to Saturday and 9am-6pm Sundays and Bank Holidays. If you go try it out, let me know what you think!